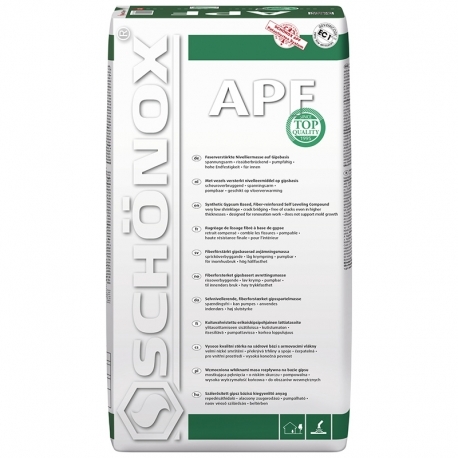 SCHÖNOX APF is a synthetic gypsum fibre-reinforced, self-levelling compound for use from 3 - 15mm especially suitable for wood floor boards, chip board (V100), mastic asphalt screeds and other critical substrates in combination with elastic and textile coverings for interior areas. Embedded fibres provide reinforcement, making it unnecessary to lay a reinforcing mat. 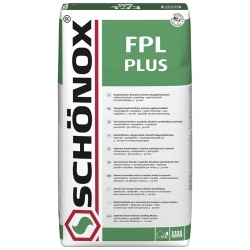 SCHÖNOX APF is a synthetic gypsum fibre-reinforced, self-levelling compound for use from 3 - 15mm especially suitable for wood floor boards, chip board (V100), mastic asphalt screeds and other critical substrates in combination with elastic and textile coverings for interior areas. 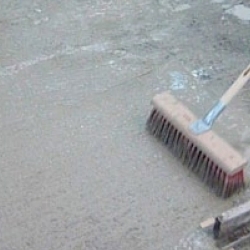 Embedded fibres provide reinforcement, making it unnecessary to lay a reinforcing mat. 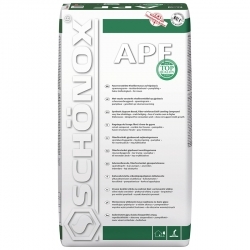 After adding of 5.5 litres of water to 25kg of powder, SCHÖNOX APF is ready to use. 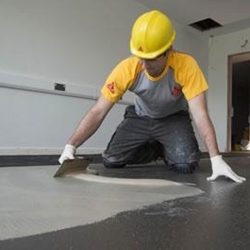 new mastic asphalt screeds IC 10 and IC 15 according to EN 13 813, layer-thickness 3,0 to 8,0 mm. 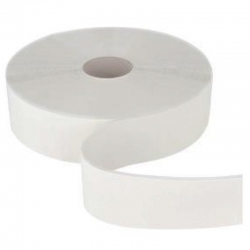 For layer-thicknesses > 8,0 mm, please obtain object-related advice. 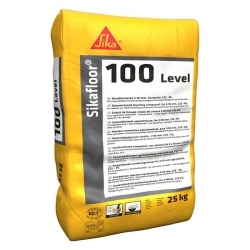 Sikafloor 100 Level is a polymer modified, cementitious floor levelling compound for 1-10mm. 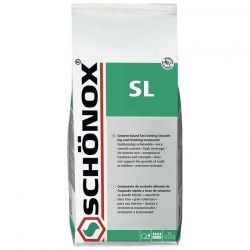 Very low emission cement based self-levelling compound suitable for interior areas. 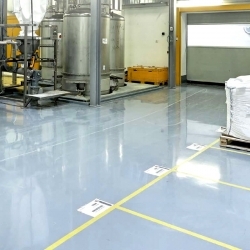 Sikafloor 100 Level is characterised by good working properties and is suitable for castor chair rollers according to EN 12 529. Sikafloor 200 Level is a very low emission, cement based self levelling compound suitable for interior and exterior areas. Sikafloor 200 Level is noted for its extremely low shrinkage. 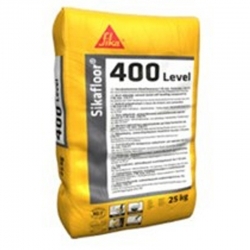 Sikafloor 200 Level is suitable for filling, smoothing and levelling suitable substrates before applying parquet, ceramic tiles, textile and elastic floor coverings. 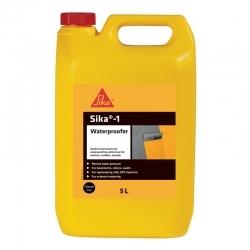 SikaScreed BB Slurry is a one component, primer for SikaScreed HardTop 80. 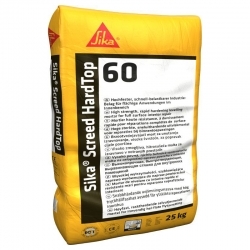 SikaScreed HardTop 80 is a special cement binder based mortar which is not compatible with standard Portland cements and therefore the only permissible cementitious bonding bridge is Sika Screed 10 BB (wet on wet method). 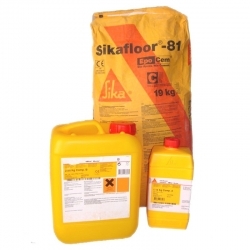 Sikafloor 81 EpoCem is a three part cement and epoxy combination mortar from Sikafloor for self-smoothing floor screeds of 1.5 to 3mm. 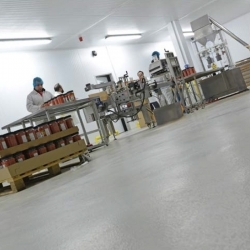 Use as a Temporary Moisture Barrier (TMB) or under Epoxy, Polyurethane and PMMA resin floors, over high moisture content substrates, even green concrete.